Alaska AK2000 Epic Cycling Adventure - What Really Happened. An Alaskan morning -- February, 2000. I was cuddled beneath the sheets watching winter swirl outside the bedroom window. The phone rang. It was Jim Gordon. "Rod, whatya say we ride Alaska this year?" I considered it briefly and said, "I think we can do this." So we did. Boy, did we have fun. This is a photographic chronicle of the tour. Photos are still coming in, I'll add more as they do. 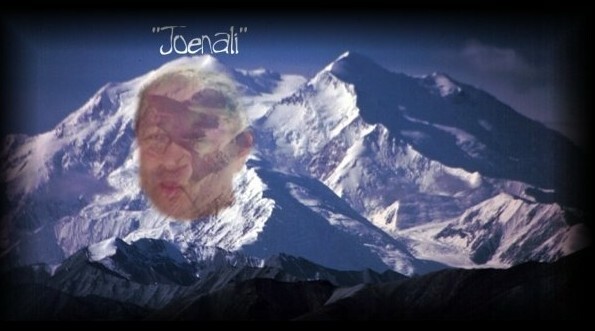 The picture below is a tribute to Joe Saxe - now and forever known simply as Joenali . Each link below pops up a map covering the days indicated. Find the fuschia camera icons on the map and click them to view a picture. Vicariousness is the next best thing to being there; though you really ought to join us next year and get some of your own fun first hand. John Mongell has created a site with some pretty cool pics of his own.